The Physician Payments Sunshine Act, passed as part of the Affordable Care Act, came into effect just at the time I was selecting an area of focus for my PhD dissertation. This legislation required pharmaceutical and medical device companies to publicly report all payments made to physicians and teaching hospitals and issued in a new era of transparency in United States healthcare. What surprised me, however, was that nurses were omitted from the mandate. This caused me to question whether nurses did not have these types of relationships with industry? Or, whether policymakers did not believe they warranted the same level of scrutiny? Under the supervision of Dr. Ruth Malone, my co-author on this week’s featured article, I conducted an ethnographic investigation into the ways that registered nurses interact with industry in their day-to-day clinical practice at 4 hospitals in the western United States. What we found couldn’t have been more different than what the policy climate suggested. pharmaceutical, medical device, information technology and infant formula companies. These interactions including attending drug company-sponsored dinners, receiving payments for speaking or consulting, and receiving gifts at conferences or other sponsored events. Among physicians, these types of relationships have been associated with negative changes in prescribing habits including increased prescribing of brand-name, heavily marketed medicines with lower safety profiles. However, to our surprise, nurses were mystified at the attention of sales representatives and wondered at their inclusion in marketing activities like drug dinners. They explained that as health professionals who cannot prescribe medicines, there was no decision-making for marketing to attempt to sway. Yet, these same nurses described their roles on hospital purchasing committees, narrated multiple instances where they had recommended treatments to providers, and described powerful influence over patient care within the hospital. This article explores the conditions under which nurses’ considerable influence and power to affect change within clinical practice becomes invisible, even at times to nurses themselves. We call this the “as-if” world of nursing practice — a well-constructed, institutionally-preserved myth that nurses do not make decisions in the absence of doctor’s orders. We hope this article will stimulate a conversation in the profession about the nature of conflict of interest in nursing practice and the need to recognize, and safeguard, nurses’ considerable decision-making power from marketing influence. Although I think it is a disservice to continue to focus on perceptions of weakness, I think exploring issues related to the ethics of nurses being compromised by external organizations, as well as within their own facilities is critically important. There is an area of inquiry in which this is of even greater importance than the areas of medical devices, drugs, and treatments however. This is the financial conflict that exists in places that nurses work as the result of insurance risk transferring health care finance mechanisms.. In my 2004 dissertation: Risk Induced Professional Caregiver Despair: A Unitary Appreciative Inquiry” I was focusing on the roles nurses play as claims agents for their facilities as de facto health insurers for their patients. These conflicts emerge as physicians, hospitals, nursing homes and home health agencies are increasingly accepting the insurance risks associated with patient care through capitation agreements, the Medicare/Medicaid Prospective Payment Systems, bundled and episodic payments and profit/risk sharing contracting. In such situations, nurses, especially nurses who advocate for their patients, face tangible, costly and immediate conflicts. Since their employers are actually responsible for the costs of such care, not some distant third party payer, when nurses believe that a patient needs additional care, the nurse is encumbering funds their employer will become responsible for paying, rather than the usual conception that additional care results in additional revenue. But, if you ask most physicians and nurses, they will incorrectly tell you that it is the patient’s health insurer, managed care organization, or Medicare/Medicaid that won’t cover the superior treatment, medication, or additional days of care. This is simply not true if the nurse’s employer has entered into financial agreements with 3rd party payers employing the above strategies. While a few nurses are willing to advocate for additional care, even when they understand, or suspect,that it is their employer, not a 3rd party that will have to cover the costs, most nurses simply assume that no conflict exists at all, accepting their facility’s story about 3rd party payer denial, and passing it on to patients and their families. Nurses do, in fact, have great agency in such cases, but it requires tremendous amounts of courage, compassion, and a backup career plan to challenge the status quo when administrators, physicians, social workers, finance personnel are all saying the patient should be discharged, and a single nurse may be the only one saying no. The better nurses understand the core financial and ethical conflicts of contemporary care, the better care patients will hopefully secure. 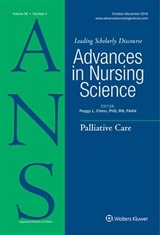 Such conflicts, as well as the conflicts addressed by the authors need to be addressed on a continuing basis, in every setting where nurses are educated and employed, and I hope that this article encourages much soul-searching and discussion because there may be no more important issue in 21st century nursing.